Rita could save her son's life. But first she had to lose half her body weight. 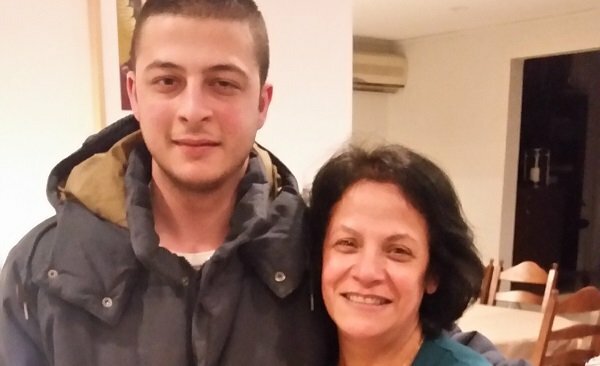 Daniel Germanos was completing his HSC when he found out his kidneys were failing. He was 17. Halfway through his final year of school. And was described by his family as an average teenage boy. He played rep soccer, was fun loving, and had never had a problem with his organs before. Yet, out of nowhere he got sick. His mum Rita and Dad George, along with his three older siblings were blindsided. Daniel would need an organ transplant. And he may have to wait up to five years to receive one. Which would mean five years of living in agony, five years attached to a dialysis machine. His quality of life would be next to nothing. Mia with Daniel&apos;s mum, Rita in the Mamamia offices. At any one time there are 1500 people waiting for an organ transplant in Australia. They could be waiting five months. Or 10 years. You never know where you stand on the list. You never know when it is going to happen. All you do know is that one day, you will get a phone call that will potentially save your life. For many Australian families this is their life. Their every day. Waiting for someone else to die, so their loved one can have a second chance. It&apos;s a roller coaster that has no end date. It is limbo. Daniel&apos;s mum, Rita, who had already lived through losing a baby to stillbirth, decided that she would donate one of her kidneys to save her youngest son. The only problem was, she would have to lose over half her body weight to be able to go ahead with the procedure. After suffering a broken back the year before, Rita&apos;s had "piled on" weight. “We always promised our children we would do the best, because we’ve lost one baby, we weren’t going to lose another one without a fight.” Rita told Mia Freedman on the latest episode of the No Filter interview podcast. “My weight was the biggest issue. Weight is a risk for surgery. It’s hard to get to the kidney because of the fat layers. I was overweight to start off with, but not obese, but then once I had the accident, I was over 100kgs, and I’m 5 ft1. I tried to lose weight before Daniel got sick. But there was no motivation." And then suddenly there was, and she had to get down to 65kgs. The only problem being that she could barley walk, let alone exercise. But nothing was going to come between this mother and saving her son&apos;s life. Rita was joined by her husband George in the podcast studio with Mia. And there were lots tears, from all of them. It truly is one of the greatest acts of love that a person could ever perform. Just 32% of Australian adults are currently on the national Register, yet 69% of Australians say they are willing to donate. That is why during DonateLife Week we are asking Australians ‘What are you waiting for?’. Visit www.donatelife.gov.au - to register your donation decision now.